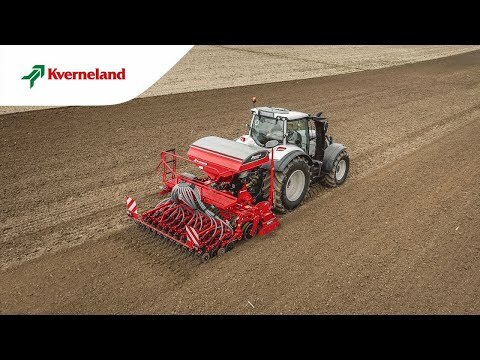 Kverneland e-drill compact and e-drill maxi. These two models allow seedbed preparation, re-compaction and sowing in one pass. The e-drill compact is offered with a hopper capacity of up to 1400 litres, the e-drill maxi up to 2000 litres. A parallelogram and a quadruple joint of the e-drill ensure the optimum adjustment of the power harrow and coulterbar for a precise seed application. Important: the adjustment of the power harrow has no impact on the coulterbar respectively the sowing depth. The metering device ELDOS accurately measures the required volume of seed by the distinctive rotor and discharges it into the seed injector where is is mixed with the air stream and then conveyed through the diffusor tube and the seed delivery hoses to the coulters. The coulterbar can be easily coupled and uncoupled with a coupling hook similar to the front loader coupling. Track markers are attached to the power harrow. Therefore, the power harrow is ready for solo operation within short time. The coulterbar is attached with the Euro-Connection directly to the roller frame and can quickly and easily be hitched thanks to the readily accessible hydraulic and electronic interface. The e-drill is exclusively designed to be combined with Kverneland power harrows (H-series and NGS). Focus 3 is the new terminal steering the e-bas system which features hopper low level sensor, various tramline systems, information about ha, km/h monitoring of fan speed, pre-emergence marker, seed rate adjustments. Focus 3 is not ISOBUS compatible. The multifunctional one-screen terminal has been developed for fast and simple control of all ISOBUS implements, giving the farmer a ‘customer made’ experience as it suits all needs for plain and efficient handling of farming machinery and tasks. IsoMatch Tellus GO is the farmer’s first step into Precision Farming. With the easy to use application, IsoMatch GEOCONTROL, it is possible to boost efficiency and save time and costs. The application includes Manual Guidance, Section Control and Variable Rate. IsoMatch MultiEye is an accessory for connecting multiple cameras to the IsoMatch Universal Terminal. With the IsoMatch MultiEye you can connect multiple cameras to the IsoMatch Tellus or IsoMatch Tellus GO Terminal. You can easily switch between the cameras without the need for an additional screen in you tractor cabin. It gives you full control and overview of the entire machine operation during day and night, because of its night vision by integrated LED’s. This increases the safety when reversing the machine or manoeuvring around obstructions. IsoMatch GEOCONTROL is an advanced software application within the IsoMatch Tellus and IsoMatch Tellus GO that helps you to control all ISOBUS compatible Kverneland Group machines such as sprayers, spreaders and seeders! Combined with a GPS receiver it fulfils the future needs in terms of easy, smart and efficient farming!